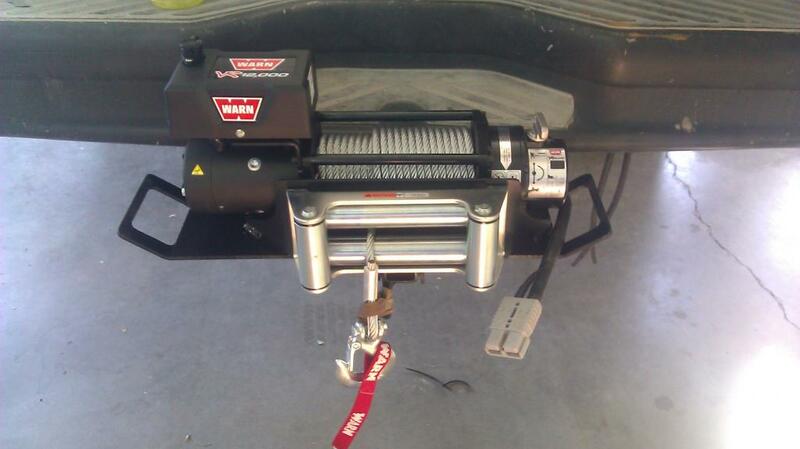 Looking for a Co. that makes a winch that will fit into the hitch, and can be stored in the underfloor storage area. For an 07 Ford E350, RB50 layoutand w/ a Aluminess rear bumper. Anyone use this type of winch, or have experience? To piggy back on this, I was wondering if one could make a heavy plate with mounting holes and a hitch insert, to be able to take the winch from the front and mount it on the back, if needed. I'm thinking the rear hitch mount would also need to be beefed up (bolted on better) so it wouldn't fail on a hard pull if the van is really stuck. Anybody done this or thought it through? Obviously the wiring would also need to be pre-planned. Trojan F&R, ARB lockers, Warn winch. we built a caddy on some receiver stock and wired van so it can be used in the front or back. I haven't found a front receiver yet, but the setup works great in back. I carried one of these for 10yrs in my 2wd vans.It isn't much but it will get you out of a jam. Its cool because you can crank it if you need to. It saved me many times. I did a front/back usuable winch that fit in the receiver tubes for a smaller vehicle. But not the van. Some issues: a 12k winch for a van weighs a lot and isn't a picnic to stow. Save some weight and use synthetic line instead of wire; it's very much nicer to work with too. A lighter duty winch might work if you get all the hardware to do pulley winching so as to increase the effective power. You need the beefier class IV hitch or better, and even then side loads are sketch even if you make a custom carrier plate with the minimal amount of lever to it. Use some thicker wall tubing than many of the generic carrier come with. Make sure your front carrier tube is up to it; some are pretty flimsy, probably meant for bike racks. On my van it's welded to the frame and bolted, with substantial plate between the two. But I still don't use a carrier mounted winch there. Using a bumper can work, but again, check your mounting (the bumper and the winch). I ran into a guy with a very beefy bumper...but it had rubber between the eight bolts that attached it to the frame and his winch completely torqued it. Power; you've gotta run some beefy cable back there. I've used welding cable, but actually got a better deal on a (non rare) 25' length of jumper cabling in pure copper. I use a power pole type connector; there's one in the photo here. You're sucking a LOT of amps so don't scrimp. I'd recommend using a good fabricator who can make something for you. Doesn't cost much more than buying stuff and doing all that work, especially since some of the aftermarket stuff is made for very much lighter vehicles, and since it's likely you'll have to do some fab work anyway. Drilling thick plate and welding under there is a chore, trust me. Certainly if mounting/carrying/weight isn't an issue, a 9k Superwinch with synthetic in a cradle is great. If trying to keep weight down, a More Power Puller may be an option, and with synthetic they can lift 6,000 lbs or pull 12,000 lbs. I dunno. Many of the vans here weigh over 10k, and stuck? add a lot more. It gets scary fast. You really need to check all the bolts and other hardware that the winch is secured to, because if you needed a big pull and say doubled that 9K you might pull apart stuff rather than move the van. Especially in a cradle. Many hitch receivers themselves are only rated to 10k (class IV). With a straight pull; you might be pulling down towards a ground anchor or a bit sideways. And that winch rating is for only part of the pull, not the whole thing. Depending on the winds on your winch you may not get that. I'm sorta reconciled to the fact that my winch is mostly for pulling my buddies in their jeeps...not me.